The most powerful of the two cameras in the SIM bay was the panoramic camera, again derived from contemporary secret reconnaissance cameras. This was a very different camera that produced enormous negatives 114 mm wide and 1.15 metres long. An exposure was made by rotating a large lens of 610-millimetre focal length from one side to the other while simultaneously pulling film through the camera. The long axis of this frame was perpendicular to the spacecraft's orbital track and imaged a swathe of terrain 330 kilometres from end to end. The imagery at the centre of the frame showed the ground directly beneath the spacecraft and could resolve features as small as 2 metres across. Included with the camera was a sensor that measured how rapidly the ground was moving past the camera in order to compensate for motion smear during the exposure. Additionally, the entire optical assembly could be pivoted forwards and backwards to allow stereo images to be taken of the same landscape with every fifth exposure. To feed this huge camera, 2 kilometres of film were supplied in a cassette, allowing over 1,500 exposures during a mission. 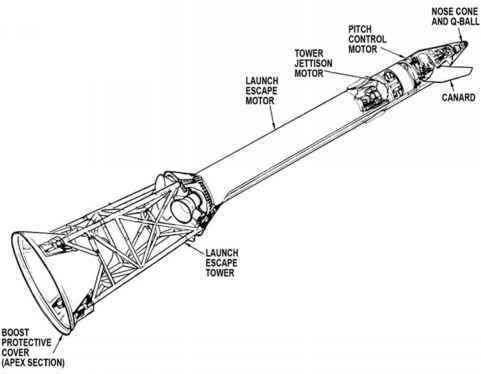 Once the spacecraft had begun its long coast back to Earth, the CMP made a short spacewalk down the side of the service module to retrieve the cassettes for both the panoramic and the mapping cameras.